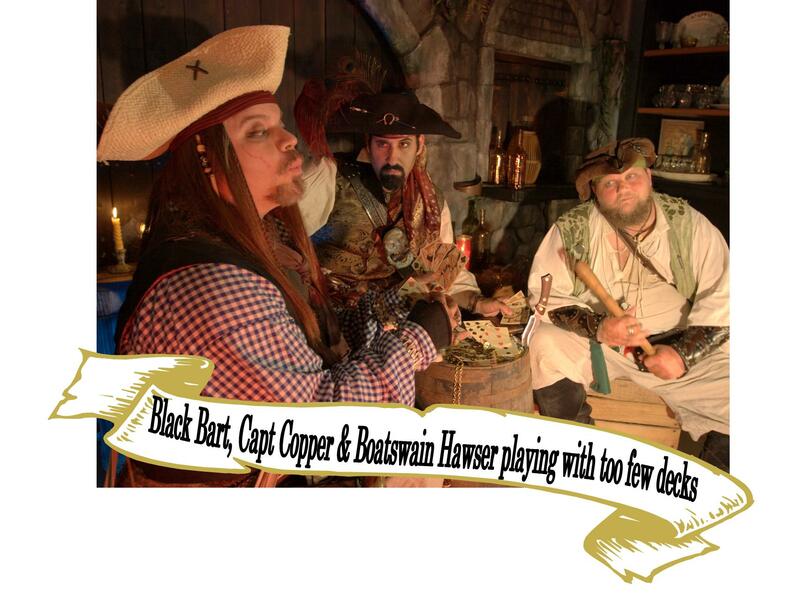 That’s right, I’m now on a deck of cards, along with a bunch of my pirate friends! You can get you own deck by using this order form. Sunday afternoon we found ourselves milling about near the end of the parade route, talking to people, and of course having pictures taken. While there I was approached by Bob and Jen Curry with a surprise gift. The night before, Bob had taken it upon himself to make some incredibly awesome cedar wood signs. Each sign had a different phrase and relevant image hand burned into them. He presented them to me, and instructed me that they were for us to use during pictures. BRILLIANT!!! His timing could not have been any better as we were actually on our way to the official photo booth for our 1:00 to 3:00 shift. I placed the signs in the fabulous haversack that TJ had made and given to me as a gift on Friday. It turns out that the signs were and exact fit for the sack, and by leaving one button unbuttoned I had easy access to them at a moments notice! We had taken no more than 10 steps before we were approached for pictures, and so I sprung into action and selected an appropriate sign, “Bilge Rat” and had one of the two boys posing with us hold it. The parents chuckled and took their picture. A few more steps and we were approached by two young girls, out popped the next sign, “Pirate Property” for the two of them to share. We progressed slowly due to a combination of pictures and my need to stop and talk to any number of the fifty million people that apparently know me. We arrived at the photo booth right on time, and introduced ourselves. As it turns out, that was almost unnecessary, as the photographer had worked with us two years ago during the Christmas on the Corners event. The same event were we all started working together. We started out the photo shoot with a picture with the photographers daughter. His wife had previously gotten a picture with me that night, and she now wanted one of her daughter with us all as well. It didn’t take long before people began to notice Captain Jack was available for pictures, and before long a line started forming. Thanks to the skill of the photographer, our antics, and the differences in the subjects I don’t think there were any two pictures that looked alike. After the first 20 minutes or so we began to autograph the pictures as well, and the line continued. We had our pictures taken with individual kids, whole groups of kids, whole families, and even family pets. Before we knew it it was 3:00, and our time was over, or was it? While Ian and I were standing off to the side waiting for a solo Captain Jack picture we were approached by Dean from Bounding Main. It turns out they were the next group scheduled for the booth, but they had a conflict and were wondering if would be possible to get out of photo booth duty. I agreed on the spot. After all the Photographer had just told us we were the best group they had all weekend, and had drawn lines they had not yet seen, and we had all been commenting on how much fun we were having. Realizing I had just answered for my cohorts, I quickly asked Ian and TJ both to confirm my assumptions, and when they did we bid Dean adieu, and started our second shift. Any time we noticed the line dwindle away I turned my already trashed voice up to 11, and would bellow out “PIRATE PORTRAITS”, holding the last syllable as long as possible. The first time I swear 3/4 of the tent turned to look. 🙂 After the 2nd time Ian began timing me. I started at ~18 seconds, and worked my way up to 28 seconds. I think, had I not already trashed my voice, I might have been able to go longer. Muahahahah. At one point I even got into a competition with the massage booth who took a cue from me and started doing the same. It seemed like no time at all had passed when the Photographer began packing up his equipment. We looked at our watches and discovered it was 5:30, two and a half hours had passed in the click of a shutter. We thanked out hosts, who thanked us profusely and then headed off to end our weekend. Over the past few years every time we have worked played together, (work is such a strong word, we have to much fun, it’s can’t be work…) our abilities to play off of each other has grown. I see it most in TJ, and am VERY proud of his growth. I was reflecting on this with a friend Saturday, and had no sooner had I relayed the story of that first night together did Captain Jack appear behind me escorting two young girls over to me to attempt to barter a sale. We bandied back and forth about prices, haggled over value for the price. “I’m even including the hair mate” “The hair is included!?!?!? Wow, that is a deal! Now what about the umbrella? On a day like this that’s a valuable commodity. I suppose that’s extra?” We asked for opinions from the group of folks around us, asked the father to confirm their worth, their work ethic, had them open their mouths to inspect their teeth, and all the while the girls were laughing hysterically. Their father frequently snapped pictures between his own fits of laughter, and interjections. We brought it to a conclusion that included a negative bidding war between the father and another person we decided to let the girls go and they bounded off to their father the three laughing about the whole experience. Afterwords my friend had a look of awe on his face and commented how much fun that whole bit was. TJ had proved my point better than I could have in an hour of talking about it. From the minute Ian and I met it was ‘go time’, “Oh look there’s someone over there!” He is just as willing to pounce on anyone as I am, and is always ready at a moments notice with something to add into the mix. We often find we have the same ideas of where to go with various bits and can pop back and forth between each other with ideas as if we had rehearsed them for days. We also both just can’t help ourselves even when we have reached the end of the day. Sunday we were walking back to the hotel to part ways at the end of the weekend, and even though the festival was officially over we still just couldn’t help ourselves. We talked of a variety of casual things, then we saw a random stranger and jumped right back into the thick of it making comments to them, after they passed we once again just dropped right back to casual conversation as if we had never even stopped in the first place.